This is a Nomarski DIC micrograph of undifferentiated sperm cells, or spermatids, from C. elegans. Note that the cells are symmetrical, not yet having formed their pseudopod. The compact dot visible at the center of some of the cells is the nucleus. 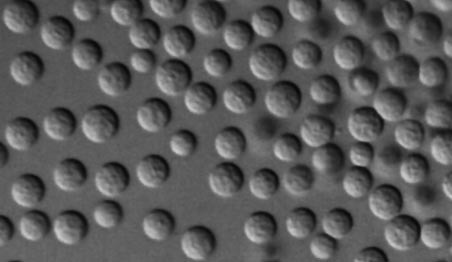 Each spermatid is around 5 micrometers in diameter, about the size of a bakers' yeast cell. The spermatids were released from a male by dissecting out the testis.